This morning Third Man welcomes a guest. Dr Dave Allen is an Executive Member and Vice President of Hampshire Cricket. He is their Hon Curator, an author of histories of the county and the editor of their annual Handbook and probably still bowls carefully flighted off-spin. Dave has been watching county cricket for over fifty years. He is one of the thousands of people who, through their support at the gate and their membership of the Counties, are the bedrock of the first class game. Today and tomorrow he assesses the future of the English County Cricket Championship. By comparing first class cricket fifty years ago with how it is now, he scrutinizes the arguments for change and challenges some of the facts used by administrators and players in 2010. On the eve of the 1959 season, John Arlott wrote of “feeling almost childishly excited at the prospect of the cricket season”. I understand those feelings of a fellow Hampshire man entirely, but I no longer share them. It’s a comment of particular poignancy for me as 1959 was the first season that I watched a county cricket match – a marvellous drawn game in the old Portsmouth week, that ended with Surrey 12 runs short with one wicket remaining. 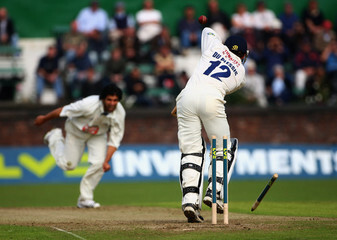 It has been difficult to feel so excited at the start of the 2010 season as the media carried a number of stories about the likelihood that the ECB would reduce the number of Championship matches yet again from 2011. To a large extent this was a response to the wishes of the players – there was no evidence that supporters wanted to see less. There were reports in the Sunday Times and Observer, while the BBC Website carried the views of Mark Robinson, the Sussex coach (6th April) and reported (1st April) that David Collier the England and Wales Cricket Board Chief Executive had already undertaken research into ways of reducing the amount of domestic first-class cricket. At a live BBC Radio Solent/Hampshire Cricket Forum (29th March) from the Rose Bowl, Hampshire’s Manager Giles White and Dimitri Mascarenhas supported a reduction, although there was a certain irony that Mascarenhas was only there because he had returned prematurely from the IPL with a serious injury. On the same evening, and despite this view, Hampshire presented the news to their supporters that their innovative international franchise would hope to add a ‘Royals Tournament’ to the English season. Reporter and former player Kevan James asked the audience (circa 200) whether they wanted a reduction in the Championship but not one person did. In the pieces that follow I will contest some of the reasons put forward to support this reduction and argue that supporters and members like me whose principal (but not sole) love is the county championship are poorly served by what is on offer and by what is threatened. If I thought I was alone I would keep quiet but I’m not, and so I shall argue against the threat at least until it becomes reality. It is interesting looking back over half-a-century. Had I known enough to do the same on my first visit I would have found little difference between 1909 and 1959. Through those years the counties had contested a three-day Championship on uncovered wickets with teams of amateurs and professionals over a season that ran from early May to the end of August (followed by the Festivals). There had also been a gradually expanding rota of overseas Test sides with Australia visiting in 1909. Hampshire (Mead, CB Fry, Kennedy etc) finished eighth in 1909 and with Marshall, Shackleton, Ingleby-Mackenzie (etc.) eighth again in 1959. Perhaps the major difference was that by 1959, fixtures had been regularised and increased to 28, plus first-class matches against the tourists and Universities. The differences with today are so marked and obvious that I will not list them in detail – change now seems endemic. The fact that the first match I watched ended as an exciting draw is not unimportant for what I have to say about the way that county cricket has changed in the past fifty years. There are some other key points to make. The weather in 1959 was marvellous and the Hampshire batsmen enjoyed themselves by scoring over 14,000 runs – a record for the county. Nonetheless Shackleton took 100 wickets, halfway through a unique run of 100(+) wickets in 20 consecutive seasons. He also bowled 1373 overs – unsurprisingly perhaps a record for Hampshire. Fifty years later, no one reached 500 first-class overs for the county and nothing approaching 1000 overall. This is the United Services Ground in 1964. Doctor Dave is either sitting cross legged just over the boundary rope down by the Nuffield Club or he's off-picture to the left behind the seating playing county cricket with a tennis ball. Note the field. The US was the fastest track in the country - a thrill to bat and bowl fast on. One interesting comparison is in the number of drawn matches. I have indicated from my first visit that the draw is an essential part of first-class cricket and can be captivating, but in the modern Championship too few are. 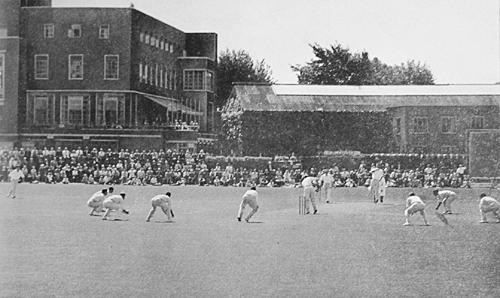 In the years from 1895 when Hampshire first entered the County Championship, until the end of the 1958 season, over 20,000 matches were played by the counties and almost 65% of those finished in victory for one of the sides. By comparison, in the county First Division of 2009, 60% of matches were drawn – even allowing for Worcestershire’s appalling record of losing ten and winning none. Very few of those matches were exciting despite the addition of an extra day. Hampshire drew ten matches in the Championship of 2009 and only one of those went to a fourth innings when, on 30 August, Hampshire faced a meaningless one over and five balls to conclude the drawn match against Somerset. Perhaps this is because the ‘extra’ day is something of an illusion. In my first match in 1959, the two sides averaged almost 110 overs in the day whereas now players are required to bowl around 15 fewer – and at modern over rates that saves more than an hour each day. However, there isn’t much mileage in trying to prove that modern championship cricket is better or worse than the game of years ago – such discussions are always enjoyable but too many contextual or arbitrary factors come into play. It is not difficult for me to consider the first few years of watching Hampshire as a Golden Age since they began it as runners-up for the first time and two years later won their first Championship but that doesn’t prove anything more general about ‘standards’, although there are some interesting facts and figures to contribute. When Hampshire won their title in 1961 they played every county twice (32 matches) and played at least once against 15 of the 16 men who represented England in that season’s Ashes series**. In 1973 when they won it again, they still competed against England’s cricketers plus some of the world’s leading players including Procter, Asif Iqbal, Bedi, Imran and Majid Khan, Turner, Intikhab Alam, Kallicharran and McKenzie. It’s different today of course because many of the leading overseas players play elsewhere during the English summer and partly because central contracts have removed the leading English players from most county games. Kevin Pietersen has played in one Championship match for Hampshire in the past four seasons – and that was away from Hampshire. So, while it is impossible to offer any conclusive proof that today’s county cricket is better or worse than it was fifty years ago, we might offer some evidence that it provides fewer potential riches for spectators. * “Old and in the Way” is taken from a side project of Jerry Garcia, once lead guitarist of the San Francisco psychedelic band the Grateful Dead, in which Garcia returned to the banjo and his bluegrass roots. ** The exception was my namesake, who missed both matches for Gloucestershire.